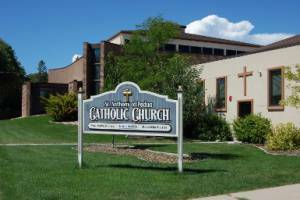 We are the people of God and members of St. Anthony of Padua Roman Catholic Church in the Roman Catholic Diocese of Rapid City. Blessed with a rich variety of backgrounds and talents, we are a living reflection of the Universal Church. Through our baptism, we continue Christ’s mission to further the kingdom of God through the human family. We share our living faith by proclaiming the Gospel in word and example. Together we celebrate Christ’s presence in worship, sacraments and service to others. In a spirit of justice, mercy and love, we dedicate ourselves not only to minister with and for the people of the community, but also to the world community.